This post is about my humble beginnings in the landscaping industry, which occurred doing chores at my grandparents’ Mclean home. 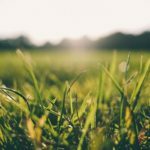 Now Lawnstarter has expanded to offer Centreville lawn care, Alexandria lawn care, Falls Church lawn care, Reston lawn care, and even Manassas lawn care services. Please consider booking lawn service through Lawnstarter this spring. Perhaps my first job in the lawn care business was doing all of my grandparents’ lawn care in Mclean, Virginia. They had an oversized lawn with large oak trees and large hills, which made cutting this grass by hand a tough job. Nevertheless, it was a pleasure helping them out as a kid and earning a little money on the side. As a kid, I would make a trip to Mclean almost every week, and once I was done with the lawn mowing I got to help my Grandfather in the garden. This was the funnest part. My grandparents both grew up on farms in southern parts of Virginia. Their idea of lawn care was driving a tractor through the fields harvesting corn; not pushing a lawn mower across their little Mclean lawn. I feel like even back in the 50s, NoVA was a little too suburban for them. But they did their best to maintain their country lifestyle, and one of those was a huge garden in their back yard. My grandfather figured even if he had to settle for a small lawn in Fairfax County, he was still going to grow his own crops. And that he did. This was not your typical Mclean backyard garden; this was a pretty serious operation. We’re talking maybe 1/5 of an acre dedicated to gardening. I’d imagine any modern-day Mclean HOA would have a fit over this. He grew almost every vegetable imaginable: bell peppers, corn, raddish, tomatoes, beats, cucumber, squash, zucchini squash, green beans, potatoes, and carrots. Additionally, they grew fresh herbs: rosemary, basil, parsley, oregano. Whenever I smell any of these herbs it brings me back to that Mclean yard, as the smell of herbs was so strong you could smell it from 20 feet away. To this day I can’t eat a sandwich or salad with tomato on it for the shear fact that I was spoiled with such good tomatoes that nothing will compare. So how did they do it? For many of the plants, it began with germinating the seeds in small cups indoors, during the winter. Then towards the beginning of the season, the area would be roto-tilled, loosening up the soil. Once the plants were transferred, the only fertilizer used was compost. Having your own source of food isn’t without issues. Many of the plants had to be enclosed with wire mesh in order to keep out bugs. Not wanting these eye-sores to compromise the look of the lawn, we planted tall flowers and vines around the edge. Another problem was animals. Rabbits were frequent visitors of the garden, to which my grandfather’s response was a home-made rabbit trap. We would set it out and watch from the window as a rabbit would follow the trail of crackers into it and become trapped. We would then take the rabbit to a nearby forest and let him go unharmed. One cool thing about this lawn is that a civil war battle occurred here. You don’t think of a typical Mclean lawn as a battleground, but quite often when we were rototilling or doing some sort of lawn care that involved digging, we would find bullets and cannonballs from the civil war area. As a kid, there aren’t many cooler things. These days, the house is being replaced with a McMansion and the garden area will probably turn into a tennis court or swimming pool.